The Widnes Wild women’s team picked up their third win of the season - and their first at home – with a thrilling 7-2 victory over Slough Phantoms at the Silver Blades Ice Rink in Widnes on Sunday evening. For the fans who had witnessed the previous week’s game against Milton Keynes, the first period must have been a bit of “déjà vu” with the Wild dominating for long periods and then Slough rushing up to the other end to score the opening goal of the game. That goal came when the visitors were shorthanded due to a tripping penalty and came very much against the run of play. Whatever was said during the period break obviously had an effect as the Wild responded with 5 unanswered goals – three in just over 3 minutes – as they battered the Phantoms’ goal with 18 shots compared to the six that Widnes Stephanie Drinkwater had to deal with. In fact, much praise has to go to the Phantoms netminder Sarah Gunstone who performed heroics in her own net and probably kept the score a lot lower than it might otherwise have been. By the time that the Phantoms managed to strike again at 53.41 (Hadden asst Bicknell), the Wild had already scored their 6th of the game (Hills unassisted 45.08) and the contest was well and truly out of reach of the battling Slough team. A second unassisted goal for Hills at 56.54 was the icing on the cake and the ensuing 7-2 scoreline sees the Wild Women move up to 5th place in the Women’s Premier League Table, where they have games in hand over all the other teams. 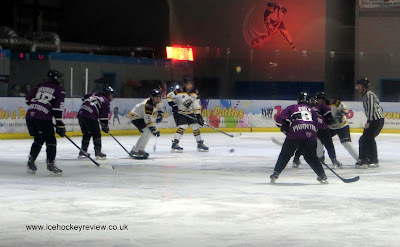 The Widnes Wild women’s team are at home again this Saturday when they entertain Streatham Storm in a 4.30pm face off. Streatham are just one point above Widnes in the WPL but the Wild women beat them 1-3 when the teams met down in South London back in October. Admission to the game is FREE so why not go along and cheer the Widnes girls on in their first ever WPL season…?